For conventional notation (round notes), click here. Are you needing to project lyrics and music for your congregation's favorite songs? The Paperless Hymnal is the answer for you. are required to use this product. Large - easy to read lyrics. Now in 16 X 9 and 4 X 3 aspect ratios. Download any or all of these songs and use them in your services. This is the best way to try out our product. They are in PowerPoint format and ready to use. This is an Excel file listing over 3800 songs. The Microsoft Office PowerPoint 2007 Viewer lets you view full-featured presentations created in PowerPoint 97 and later versions. You can view and print presentations, but you cannot edit them. This textbook is written with the beginning music student in mind. Looking for choral music? These arrangements are written for mixed a'cappella groups. Who uses The Paperless Hymnal? Considering a new hymnal for your church? 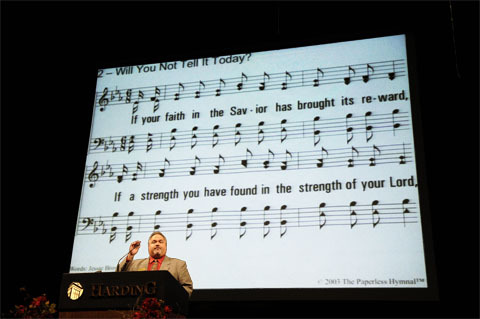 These songs are not scanned from hymn books. They are custom designed for projection with Microsoft PowerPoint. Registering entitles you to receive corrections, timely information about new releases and updates. PowerPoint® is a registered trademark of Microsoft®. The Paperless Hymnal® is the registered trademark of James Tackett, Austin, TX.